Tony Nester, of Ancient Pathways Outdoor Survival Courses, displays the contents of his urban "bug-out" bag. 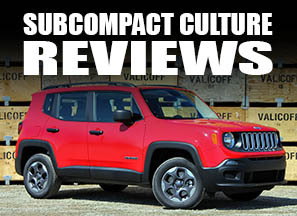 Whether adventuring off-road in a compact 4x4 like our beloved Teal Terror, or lumbering around in a fantastically huge Unimog, or even on a road trip to remote areas, one typically thinks of many things to bring along for the ride: food, maps, music, sunscreen (if you have ghostly skin like me), and clothing. But sometimes, the most important items are overlooked. 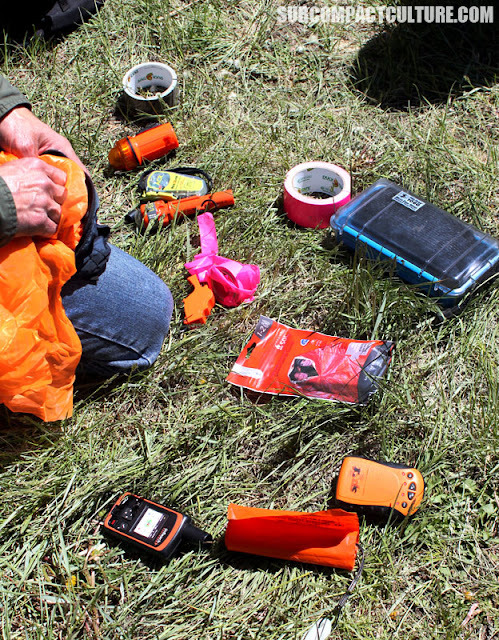 Bringing enough gear or emergency items along for a fun trek doesn’t seem like any “fun” but heaven forbid, if you get stuck or have a true backcountry emergency, critical survival is of utmost importance. It could mean the difference between life and death. 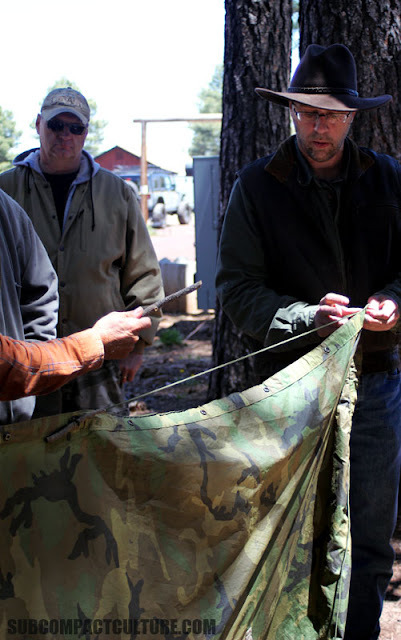 While at Overland Expo West 2016 in May, I attended several classes, one that really stood out was hosted by Tony Nester of Ancient Pathways. Tony is a seasoned wilderness survivalist who instructs classes dealing with desert survival and primitive technology. The class/workshop he was teaching at Overland Expo dealt with how to survive in a critical situation, whether it’s an urban jungle or a wilderness environment. 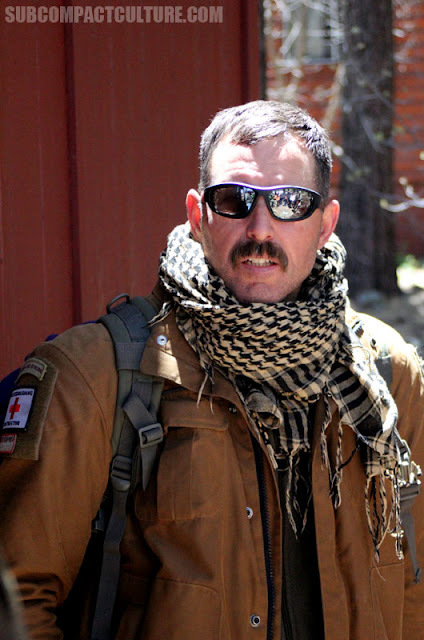 Tony started the class with the most critical item you’d need during a major catastrophe: water. He laid out tips to purify water no matter if it came from a mountain stream to a mucky mud hole. The below summarizes a few good options to prepare water safely for consumption, depending on what contaminants, viruses, or chemicals are in it. One may need to do a few of these steps combined to safely clarify the water to make it safe for consumption. If you start experiencing flu-like symptoms after purifying your own water, get checked out by a doctor. It may be you contracted something that slipped through your purifying process. Boiling: Tony suggests bringing water to a rolling boil it for at least one minute. Boiling effectively kills off bacteria and viruses but does not take care of chemicals. Filters: Another method is filtration. Ancient Pathways suggests Berkey filters as an industry leader. Tony suggests getting a filtration system that has ceramic cartridges as they are cleanable vs disposable like cheaper models. Chemical disinfection: chemical tablets like iodine, chlorine dioxide, or adding a few drops of bleach can kill off little pathogens or take care of chemicals. 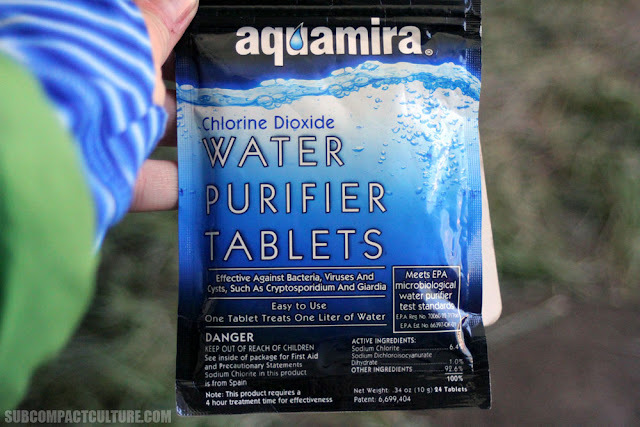 Products like Aquamira or Potable Aqua are suggested. Tips to include after disinfecting the water is to add vitamin C tablets to alleviate the poor taste of water post-cleaning. 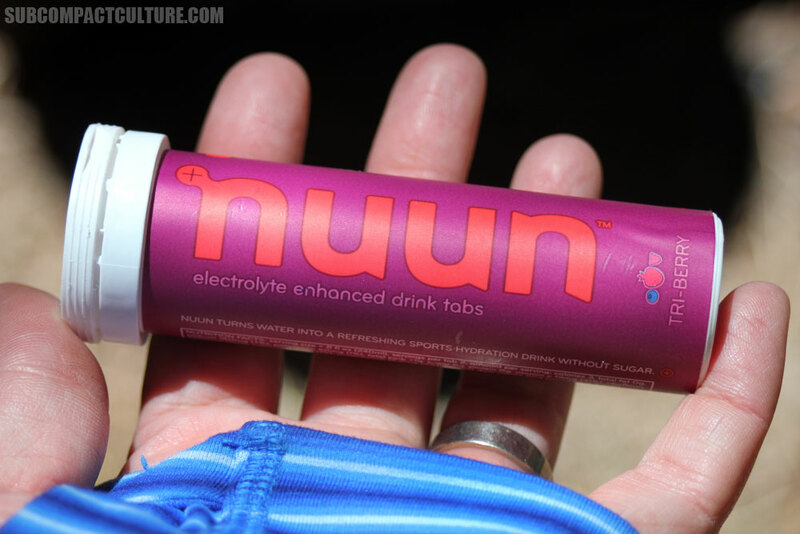 Additionally, adding electrolyte powder or tablets will add essentials to your water before drinking. Nuun is a much better product than what is used in Gatorade, as the latter has high-fructose corn syrup and other no-no ingredients. 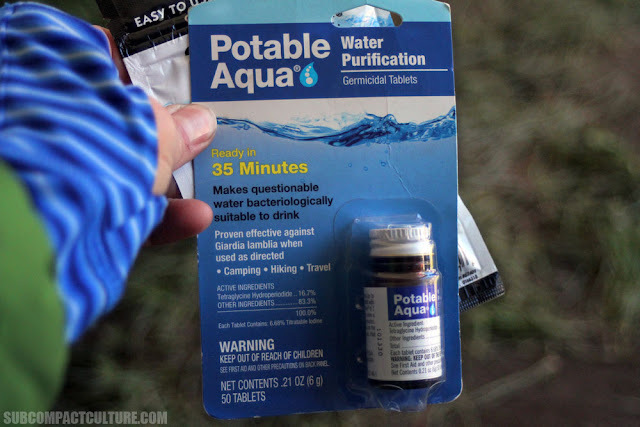 Are you out of water, dehydrated, lost, and worried? He suggests three major points, to keep you maintaining as much energy as you can while waiting for help to arrive. Keep covered with loose clothing. Stay put and conserve your energy. Another equally and critical item you’d need during a major catastrophe: preparedness. 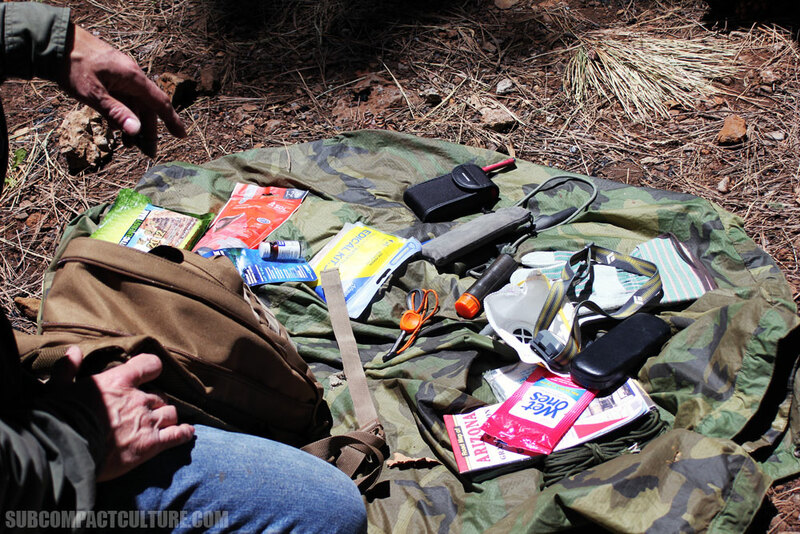 Tony showed the class several gadgets he deems necessary in his “bug-out” or emergency travel bag. Additionally, he demonstrated several techniques for shelter (more on this later). If you headed out in your vehicle or on your motorbike and left your travel plan details with anyone, stay put. Your vehicle is always a larger signal than you are. Signaling devices: these can be signaling mirrors (as seen above), bright orange items, brightly colored identification tape, glow sticks, or strobe lights. Also, you can use shiny pots and pans (if brought along on a trip); flashlights, headlights (three times flash, then pause, then three times flash for SOS). Anything for getting noticed, from the ground or the skies. For instance, bright orange survival blankets can be viewable from up to two miles away. 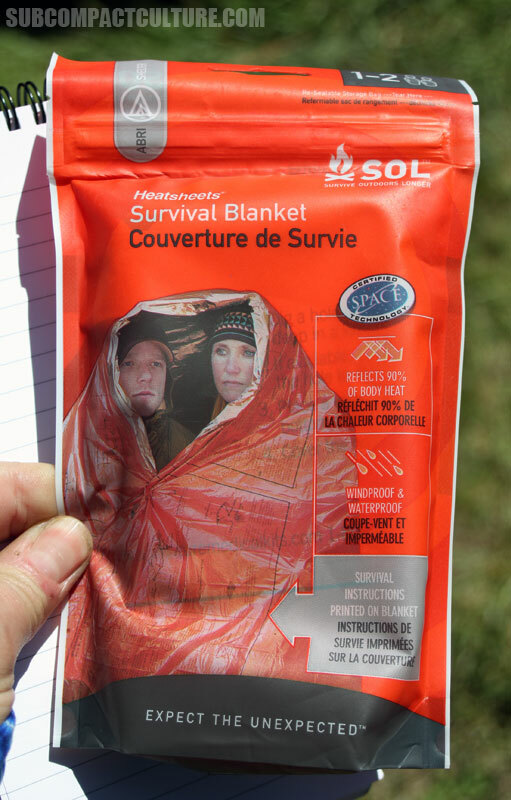 Tony suggests heat sheets, not space blankets because they only have a six month shelf life. Glow sticks can be tied to a long string and whipped around in circles above your head for greater visibility. If you are in a clearing with lots of downed logs/trees, make a large “X” in the clearing instead of “SOS.” Tie your clothing or anything else noticeable up into the trees. 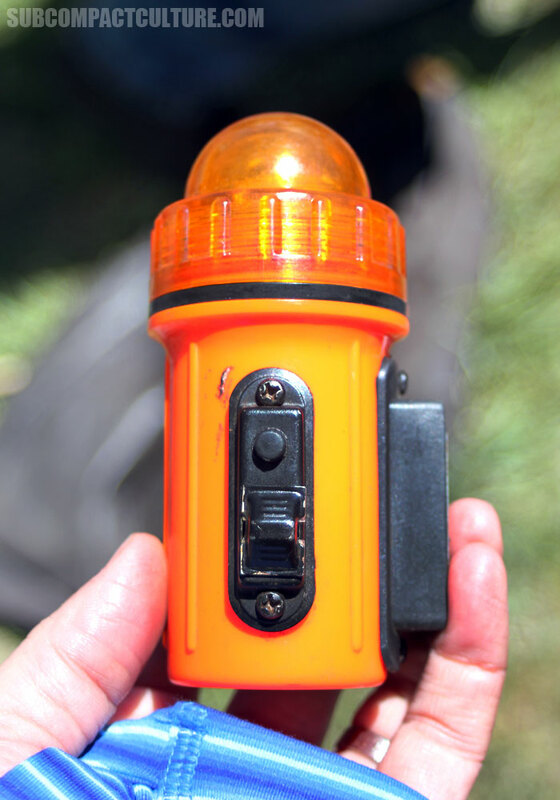 Pulse your flashlight on and off, that can be seen up to five miles away. Anything odd = greater chance of getting noticed. If stranded, keep turning your cell phone on and off every few hours. Even though you don’t have service, cell phones can still ping towers can be seen to triangulate an area where you may be. This is an example of an emergency strobe light, which is a good way to get noticed if you're lost. 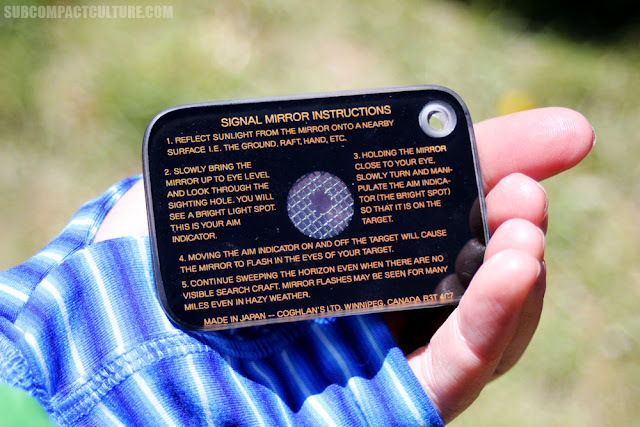 Use heat sheets, like this one from Sol, for both warmth and as a signaling device to attract attention. Globalstar offers satellite phones that work anywhere in the world—no cell towers needed. The ResQLink is a personal locator beacon that can be used in emergency situations to alert people to your whereabouts. SPOT is another variant of a personal locator beacon. 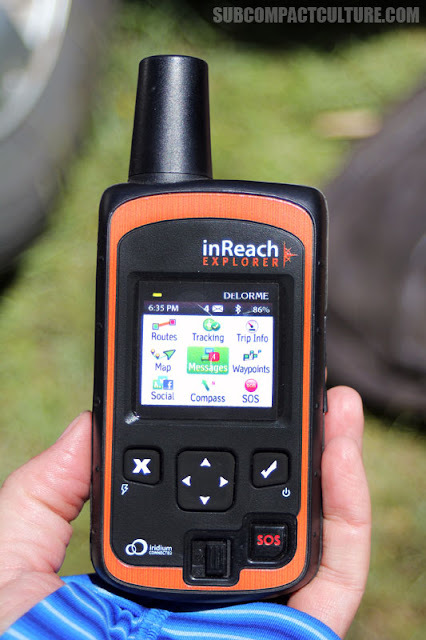 The inReach by DeLorme is global satellite communicator with built-in navigation and waypoint routing. It features built-in texting capabilities. 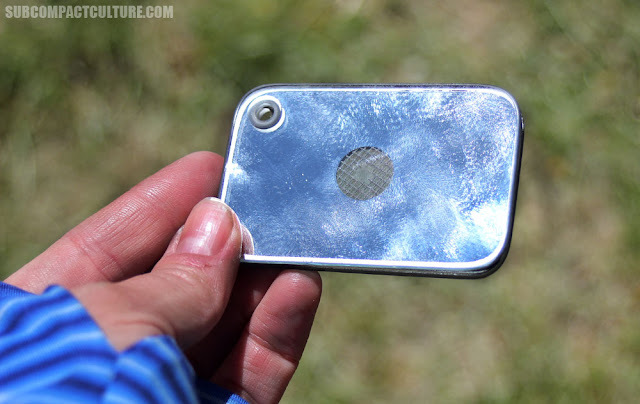 Not only can you plan and track your adventure, you also have the SOS feature in emergencies. In addition to visual signals, audible signals are equally important. 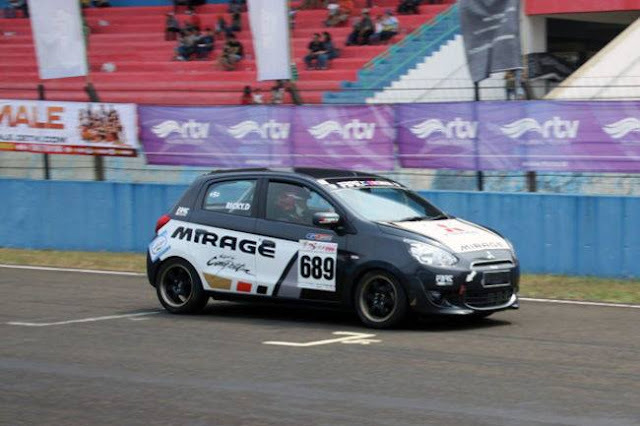 Horns, whistles, stereo music, revving your engine—these are all things to consider. 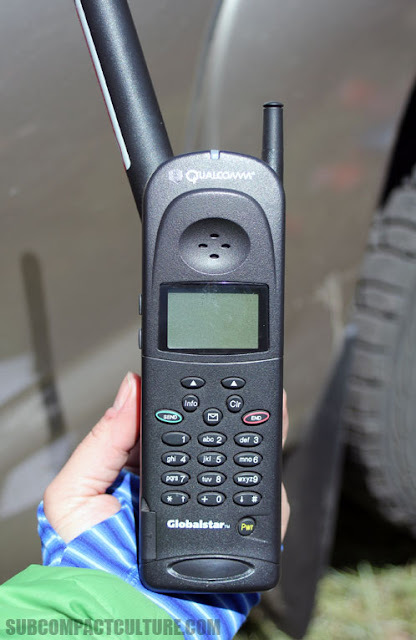 Communication devices such as satellite phones, the DeLorme inReach satellite messaging device, SPOT device, ResQLink personal beacon, or a cell phone. 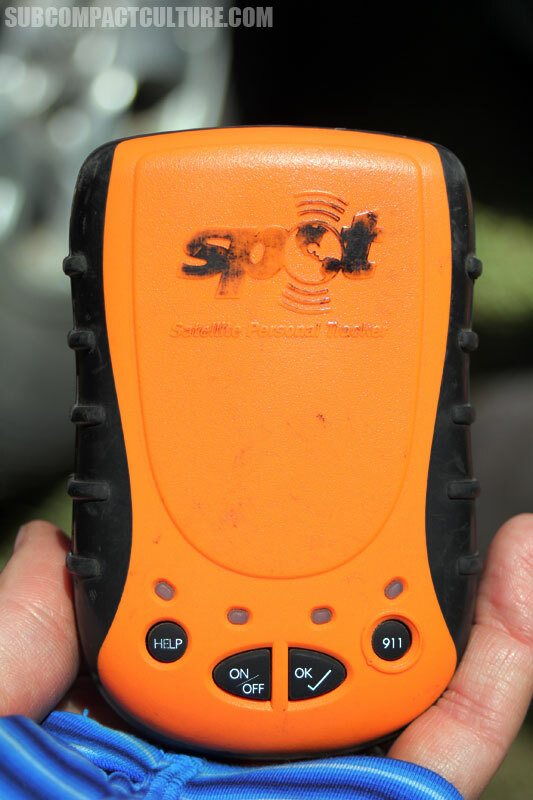 Some satellite devices may be rented from an outfitter. First aid kit containing essentials like bandages, gauze, tape, non-latex gloves, tweezers, cotton balls, Vaseline, etc. No, that's not just a fancy travel bandana. It's a shemagh (pronounced: she-MOG). If it's cold, it can act as a scarf. If it's sweltering hot, douse it with water and it'll cool you. Pull it over your nose/face during dusty conditions. It's an extremely versatile bit of clothing. A large bandanna will also work. Tony demonstrating the basics of creating an emergency shelter. A final critical item one needs during a major catastrophe is shelter. A few tips/tricks follow that help you through the heat of day or cold of night should you not have normal shelter. No car, house, hotel? No problem. Your first shelter goes with you everywhere you go, it is you. Your clothing is imperative. Wear quick-dry gear, not cotton unless you are in the dead of heat and make your clothing wet to disperse heat out. Bring or wear sunscreen, bug spray (like permethrin or OFF), loose fitting wares if summer, and multiple layers for winter. No “widow makers”: stay away from dead, tilting, or diseased trees. Wood: need to collect for a fire, underlayment for your shelter or bedding. Weather: be cognizant of setting up camp in canyon floors (cold), edges of forest/canyons, near large bodies of water (wild animal thoroughfares). Water: watch for animal tracks or droppings near or next to water, this will indicate a potential issue with you vs. big mama bear or elk, etc. “Wigglies”: snakes, centipedes, rats, etc. Stay away from boulder fields where these creatures love to live. Keep in mind that cow pies = scorpion heaven. They love to live underneath. Once you found a spot suitable for emergency camp, clear away any rocks, debris, etc. Make your area is clean for camp. Critters like organic material and debris. If you don’t complete this step, you may be in store for some activity with Mother Nature later on. 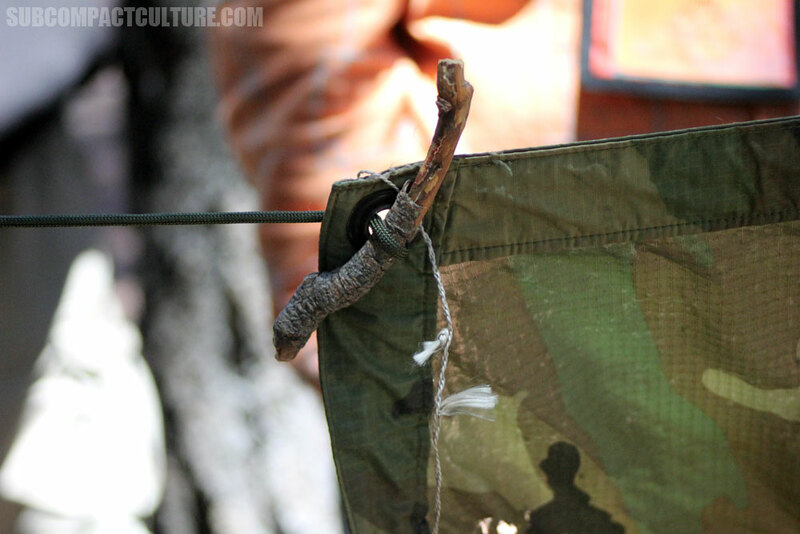 An example of a cobbler peg to help secure a shelter. 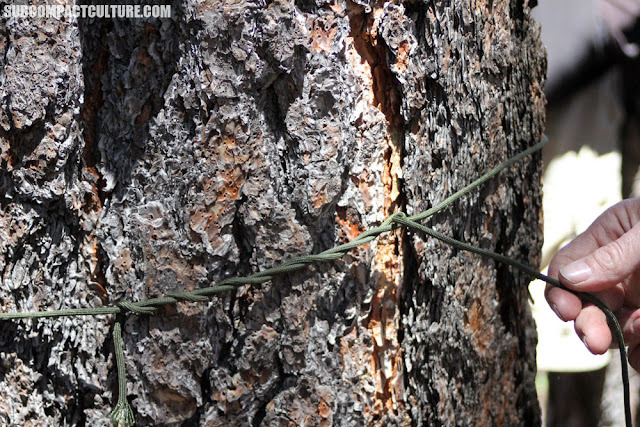 Make sure to learn the “timber hitch” knot beforehand (it's very useful). Don't know knots? Tie lots! 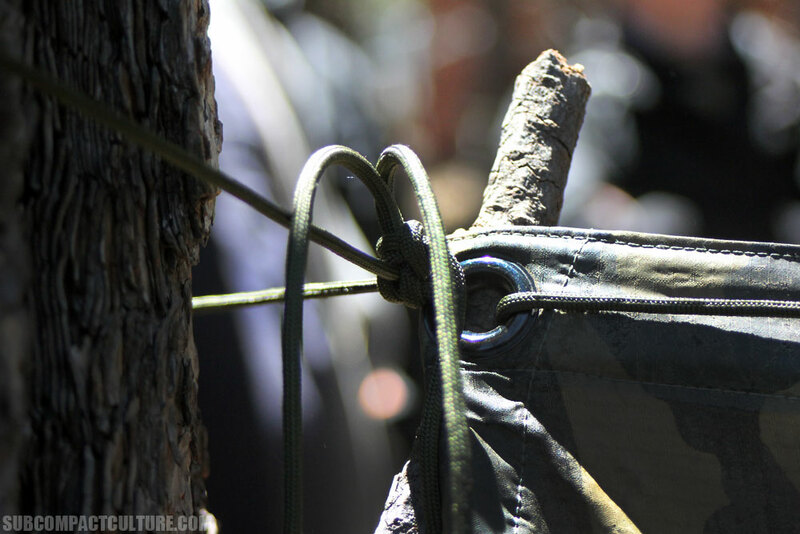 You'll need something to help suspend your tarp or shelter. However, if you don’t learn it (or you forgot like me), remember this: If you don’t know KNOTS, just tie LOTS. Tie one end of the cord around one tree trunk; thread the cord through each grommet and around the wood “pegs.” These pegs will stop your tarp from sliding around on the cord. Tie the other end of the tarp down to other tree bases or rocks to secure it. If in severe heat, dig out and trench down 12” into the ground to keep you cool at night. If in severe cold, grab small branches, pine needles, and leaves to make 12” high bedding to keep frozen ground and hypothermia at bay. Learning specifics regarding how to survive in critical situations really made me think. A lot. I know a good bit about what one may need in an emergency bag or being exposed to nifty gadgets already, but to take my knowledge base to the next level with this course was very insightful. 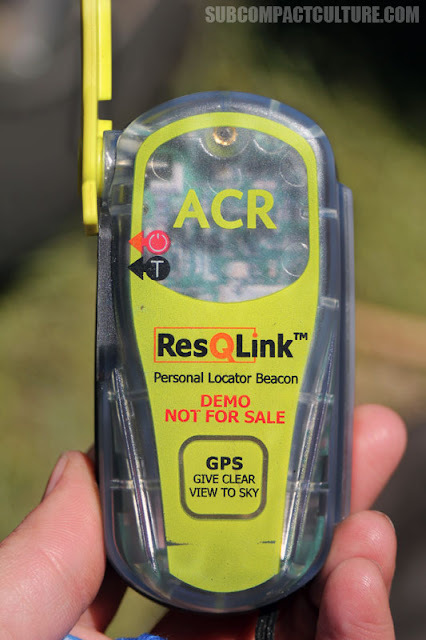 Scary, but something that should be understood and respected when one ventures out into the wilderness, desert, or other remote areas to play. Respect yourself, your surroundings, and especially Mother Nature. Because if you don’t, your play time may turn into a scary situation. 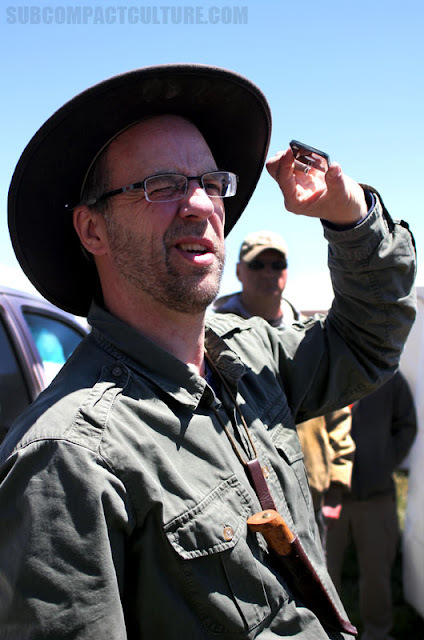 Tony Nester of Ancient Pathways demonstrating a signaling mirror at Overland Expo West 2016. This is a great post! I think some emergency supplies to should in a car no matter what you're doing or where you're going. I'd have it and not need it than need it and not have it.